Finding things to write about in the offseason can be difficult when your team isn't part of the playoff picture. We could review everything, but really, why would we want to? They improved over 2011, but are still at the bottom of the pile in the AL West and barely hanging on to okayness in the league. So instead, we'll focus on one particular player so that we may look back upon the other players that were not Miguel Olivo. That's not to say Olivo was completely horrible to the point of wanting to scoop out your eyes with a spoon. To the point of sharpening said spoon before we attack our own eyeballs, on the other hand..... His defense was frightening in that he played defense, in a manner of speaking. Rather than focusing on his defense, we're going to take a look at his offense. Or at least, his own attempt at it. For the purposes of this post, I played with numbers and one of them bit me. Since it's a cute little number, I decided to keep it in hopes of shedding light on things a little more. What I did was look at plate discipline, sort of. We all know he's bad, but how bad really? That I can't tell you with absolute certainty unless I plugged numbers in for every single major league player and I'm already in the corner, weeping my little eyes out just thinking about it. So instead, we'll compare him to Mark Reynolds and Joey Votto, two guys on the extremes of plate discipline. I haven't tested it extensively yet, but as a quick explanation, here's what I did in equation form: ((BB-IBB+H)/PA)-(SO/PA). My high school math teacher would cringe at the way it's written, but it works fine for my purposes. PA is plate appearances and SO is strikeouts, by the way. Basically, the number of times the player actually reaches base by hitting the baseball and with his batting eye per plate appearance subtracted from the number of times he strikes out per plate appearance. I kept the number the same as batting average, OBP, etc., so it's written as .000. The higher the number, the better, obviously. I've only checked 15 players, so it's not like I took it to a lab and did every test imaginable with it yet. It's up to you whether it's complete crap or not. Here's hoping for only partial crap! I should add that OBP is also a way to see what kind of discipline the player has, but I wanted to isolate the player's ability to reach base via walk and hitting the ball compared to doing nothing productive by striking out. Intentional walks don't have anything to do with the player except saying something about the opposing manager, which is why it's taken out. Everything's divided by plate appearances because walks aren't included in at bats and it's a better number to use anyway. Sacrifices don't count towards at bats either, but it's at least productive. However, we're not looking at production. This is an attempt at looking at the numbers to figure out plate discipline and the end result while at the plate. Being hit by a pitch or reaching on an error is a result of the pitcher or the defense, respectively. The OBP stat includes intentional walks and hit by pitches, which is why I chose not to use it. If you're curious, OBP=(H+BB+HBP)/(AB+BB+HBP+SF). I changed it slightly and added strikeouts into the calculation to see how he does on a bigger scale, I guess you'd say. That's not to say OBP is a stat that's utterly useless because it's not. It's useful, but it didn't provide all of the information I was looking for. With all that being said, this whole plate discipline thing was born out of boredom and curiosity and is just a fun* way to look at an individual player. We know Miguel Olivo can hit the crap out of the ball when he actually makes contact, and that his defense is questionable at best and the dude never walks. I was bored and decided to use the whole equation thing to see just how bad and man, I wish I could take it back. I knew he was bad, but when the number comes out as a negative* it makes things all the more mind bendingly horrible. The one player that's been worse in his career is Mark Reynolds, and that's saying something considering Reynolds is a K machine sent from the future by the baseball gods to screw with us all. For his career, Olivo's plate discipline number comes out to -.002. Mark Reynolds is also way down there at -.010. As a comparison, Joey Votto's career number is .205. So far, his is the highest I've found as far as the resulting number. In essence, Votto is reaching base via hit and walk at a much higher clip than he's striking out, giving his teammates that many more opportunities to score runs with a runner on base. We all knew Miguel Olivo wasn't exactly the most patient of hitters, but now there's yet another number that backs it up! His ability to hit balls over the fence is his biggest (and possibly only) redeeming quality as a player. I'm still marveling at the fact he's struck out more times in his career than he's walked or gotten a base hit, and probably will continue to be marveled for many more seconds. Possibly even minutes. Jack Z, whatever you do, do NOT, in the name of all that is baseball, pick up his option for 2013. On a side note, Olivo's best year was his rookie season, 2004 with a .040, which is still worse than Adam Dunn and Wilin Rosario's career numbers. Dunn is at .063 and Rosario is at .050. Think about that for a minute. Olivo has been worse, as far as plate discipline, than the guy who's led the league 4 different times in strikeouts. It's not that Olivo strikes out far too often. Actually, no, I take that back. He strikes out far too often. That, combined with never walking unless the pitcher throws it to the backstop 4 times in an at bat, equals no plate discipline. It's a freaking negative number! Over at Lookout Landing, Jeff Sullivan has done multiple posts on the fact Olivo has more home runs than walks every year starting in 2010. He has nearly as many home runs as walks, as a matter of fact, and may just do the unthinkable and crank more homers than walking if given another year or two. He's done an impressive job on giving you insights on the futility that is Miguel Olivo. I decided I'd take a look from a slightly different angle and holy crap Miguel Olivo. 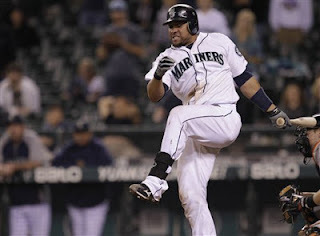 "Olivo'd" may become a verb for Mariner fans for years after this. Boy, Justin Smoak has had a pretty bad game, getting Olivo'd 3 times so far tonight to give him the hat trick. See? Yeah, that'll catch on, he tells his cat as it looks at him like he's finally lost it. In case you're curious, here are the career numbers for Olivo, if you'd like to take a look. Remember, sharpen that spoon first.